In content marketing today, quality is more important than ever. 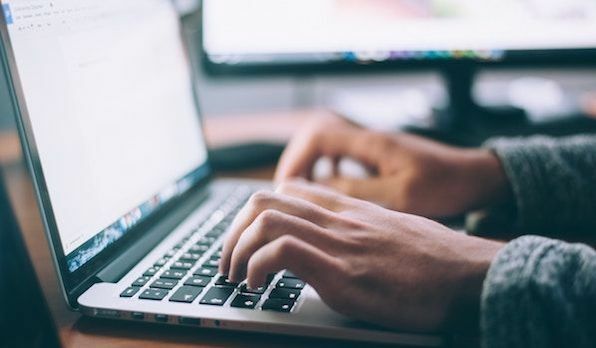 Reputable marketers need to produce content that is well written, highly researched, data-backed, and visually engaging. To gain the attention of smart algorithms and smarter people, that content might need to be on the longer side, too. That’s a lot to ask of a single article. What’s more, it’s a lot to ask of a single person. So how should one person go about doing that all? I write a lot, which means that I need to use my time wisely. This is the system I’ve developed for creating quality content without sabotaging my schedule. This is how I write lengthy and well-researched articles in just two hours. While that time frame may not work for everyone, the process definitely can. Before launching into a detailed how-to of my process, I’ll give you a quick rundown of the process. To be as clear as possible, I’ll use this article that you’re reading as the basis of my timing benchmarks. Quick Disclaimer: This article is a bit unusual in that it’s not as highly researched as other articles I’ve written. The content involves more explanation and less data. Three weeks before: Came up with the idea, and jotted a few notes down. 2 minutes. Day before writing: Created the outline. 9 minutes. Day of writing: Conducted the bulk of my research and wrote the article. This includes the time I took for a restroom break, getting a cup of coffee, sending two texts, checking my email, and taking one phone call. 1 hour 12 minutes. First copy edit: 10 minutes. Every writer has his favorite tools and techniques. I don’t insist on any one right way to produce a blog post or article. I do, however, want to share some of the things that I’ve found to be helpful. It’s cloud-based. I can access my writing on any device, anywhere, anytime. It’s browser-based. Because I do all my research in web-browsers, it helps to also do my writing in a web browser. My mind and fingers are accustomed to the keyboard shortcuts, the techniques, and the extensions. It’s shareable. I share the articles that I write with other team members so they can help me with the process of editing and proofreading. I can download or access files in any format. Some sites for which I contribute use Word documents. Even though I don’t write in Word, I can still download my documents in Word. Google Drive doesn’t have the bells and whistles of a full-fledged word processing platform, but it does have all the functionality that I need for writing articles. One great timesaving feature of Google Drive is that I can do nearly anything I want to do with a few swift keyboard shortcuts. In order to create that hyperlinked text, I copied the URL of a bookmark (command + c), highlighted the section (shift + alt/option + left arrow), opened the hyperlink menu (command + k), and pasted the URL (command + v). Keyboard shortcuts for the win. I do most of my writing on a 15-inch screen. Sometimes, I use a triple monitor configuration for heavy-duty research. Usually, the single-screen display works just fine. 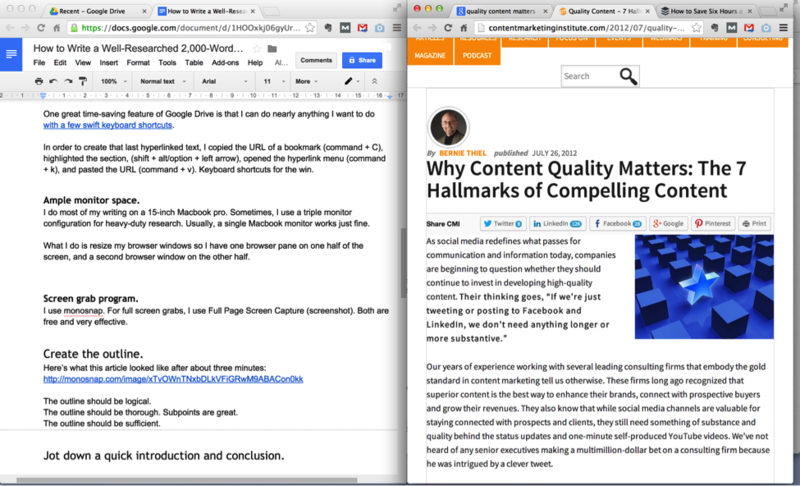 When I'm writing a post, I resize my browser windows so I have one browser pane on one half of the screen and a second browser window on the other half. The left browser window is Google Drive. That’s where I’m actually doing my writing. The right window is where I do my research. I took the screenshot above in the middle of my article writing. As I continue writing, the right browser window fills with tabs -- as many as forty or fifty sometimes. I cycle through them using keyboard shortcuts to find the material that I’m using for research. A great way for to increase your article’s reader engagement, social media CTR, and Google image search traffic is to add and optimize it for images and screenshots. I constantly create screenshots in order to add images to my articles. I use an app called Monosnap. To capture an area with Monosnap, I use a keyboard shortcut, which immediately opens up a set of crosshairs overlaid on my screen. I position these over the area that I’d like to capture. Monosnap also allows me to edit the screenshots with some minimal options. Using a screen grab program is indispensable for what I want to do -- provide great content with visual appeal. 4) The ability to read/research quickly and type comfortably. I tend to type fast. Here are the results from my latest speed typing test. 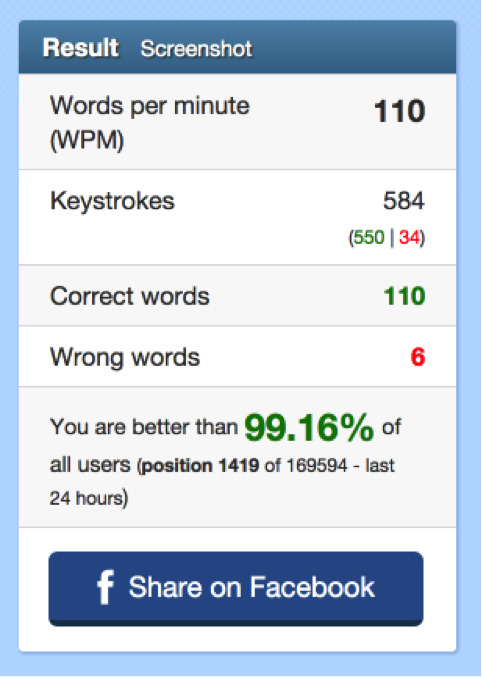 If I were to type that quickly for two hours straight, I would produce 13,200 words. Obviously, I don’t create that much content for a single article. The vast majority of my time is spent researching. You don’t have to type really fast in order to complete an article quickly. Why? Because typing is just one aspect of the entire process of article creation. Most people can type a lengthy and well-researched article in roughly the same amount of time. Research is the critical time-consuming element, not typing. Step 1: Create the outline. Now, let’s jump into the actual process of writing and researching. Pick a topic and a title. Creating a title and settling on a topic is the important aspect of all. In the one-minute video below, I discuss the topic of article ideation in other articles. Use tools, and do brainstorming. It works. If you want to produce a piece quickly, you should pick topics that you’re comfortable with writing on. If you pick a topic, but can’t come up with an outline from your head, you may be writing about an area for which you lack sufficient knowledge. If you pick an area like this to write about, then you will have to spend more time researching, which means that you may not be able to do it in under two hours. Here’s what this article looked like after about three minutes of thinking and working. You see stuff in this rough outline that you don’t see in the finished product. I even spelled some words wrong. Big deal. This is where I’m simply scratching things down and getting my thought process going. The outline should be logical. An outline has to make sense to the reader. The point of an outline is to provide a cognitive structure for the user to follow as they work through your article. 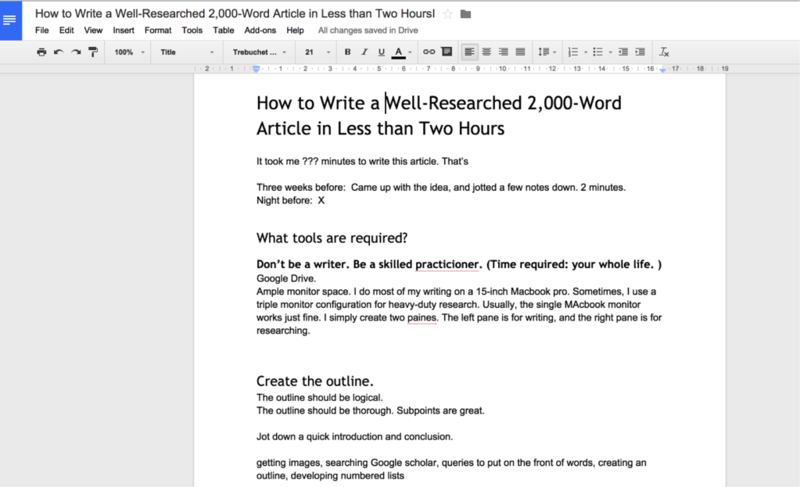 The outline is also a tool for you, the writer and researcher. The basic idea is just to create a structure so that the article is well organized. The outline should be thorough. The best outlines are those that don’t simply provide the main points, but also provide subpoints. Subpoints are where the article goes deep and gets advanced. 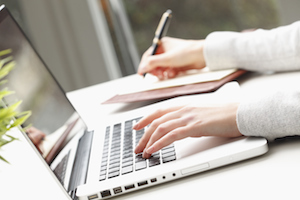 A thorough outline like this will help you when you go to do the writing and research. You can work through the article in an organized way, dividing your research into sections. Step 2: Jot down a quick introduction and conclusion. After you’ve created your outline, you’re in the perfect mental state to write an introduction and conclusion. State the topic you’re dealing with. Before anything else, the reader needs to know what he or she is reading about. Discuss why it’s important. You want your reader to know that the topic is important, so you can encourage them to read the whole article. Sketch out a game plan for the article. Tell the reader where you’re going in the content that follows. A successful conclusion summarizes the article’s content and adds any lingering thoughts. Most of my conclusions are a final point that simply says: “Conclusion” and has a few sentences. I also like to wrap up my article with a question for the reader. Introductions and conclusions can be simple and formulaic. That’s why I can write them before I write the rest of the article. I know where I’m going, and how the article is going to look as it ends up. Writing an introduction and conclusion takes me four to six minutes. I do very little (if any) research during this phase. Step 3: Write and research. Write and research at the same time. For me, writing and research happens simultaneously. I already know what direction I’m heading in as I write an article, so I don’t necessarily need to learn about a topic before I write on it. This gives me an advantage. My research is focused. For example, if I’m writing an article on, say, saving time on social media, I know what kind of research to do. 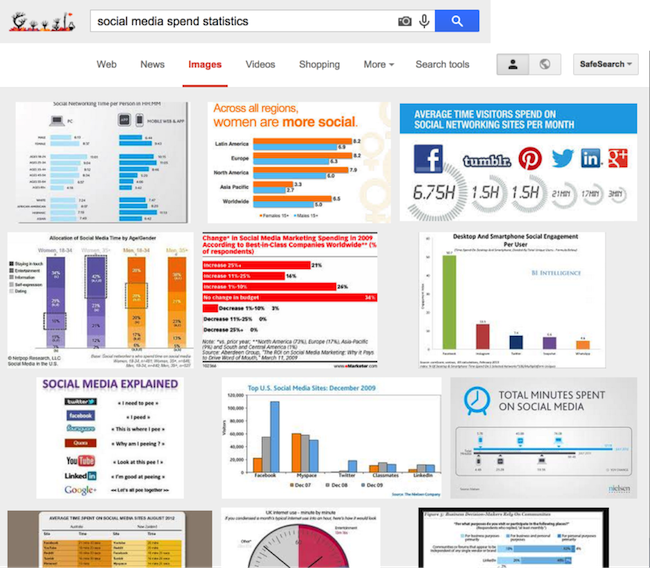 I’m not researching generic information about “social media.” Instead, I’m searching for advanced and specific things like “social media time expenditures marketing data.” Queries like this also help me pinpoint the right data to include in my post, faster. My primary research tool is Google. Sounds pretty simple, I know, but it’s the best tool there is for the kind of research that I do. But remember, Google is only as effective as the person who is doing the searching. 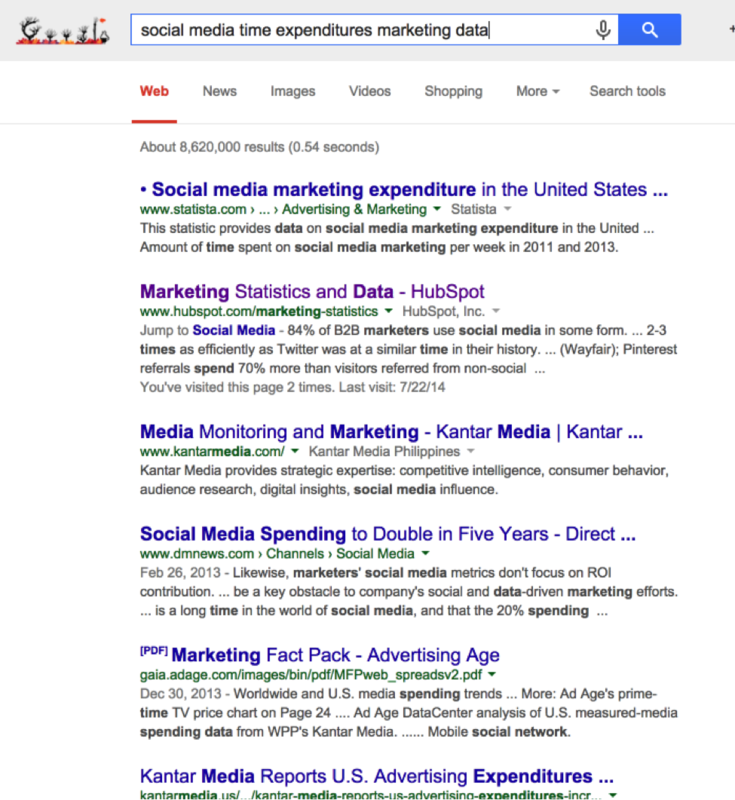 Below are a few tips for getting better results out of Google. Often, I want to cite studies or advanced research in my articles. For this, I use Google Scholar. 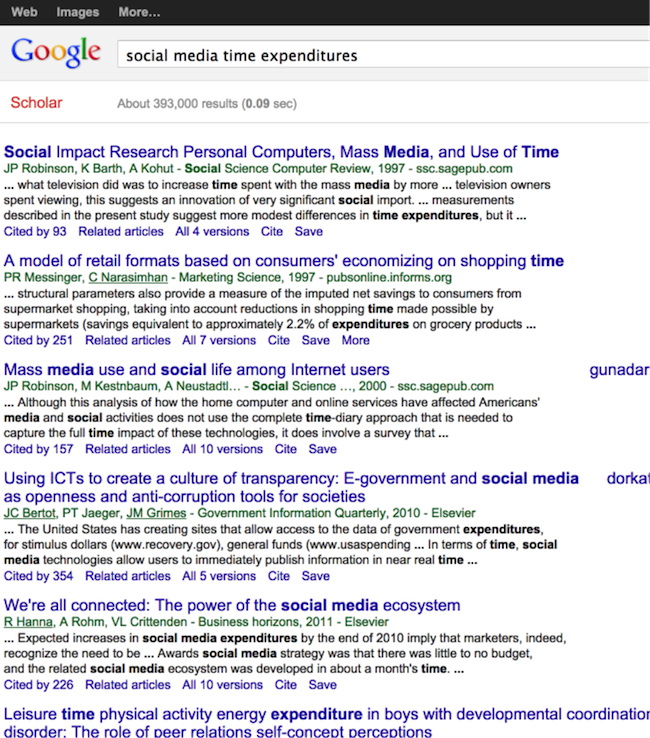 I have the main search page of Google Scholar bookmarked, so I can access it instantly. I type in queries, similar to the way I do in a general Google research. The results, however, are usually more advanced. Results like these are exceptional. They’re produced by authoritative researchers with great credentials. This is the kind of stuff that I want to cite in a well-researched article. Try out advanced query techniques. Another feature of my research involves my query techniques. Certain sites have some of the best information on certain topics. In order to confine my searches to a single site, I use different query techniques. 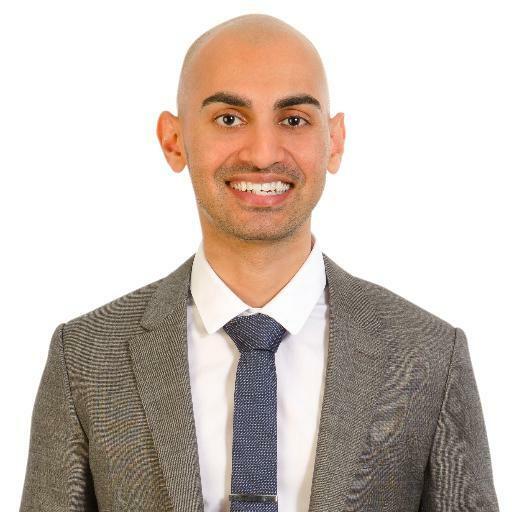 For example, I used the following query: inurl:blog.hubspot.com social listening. 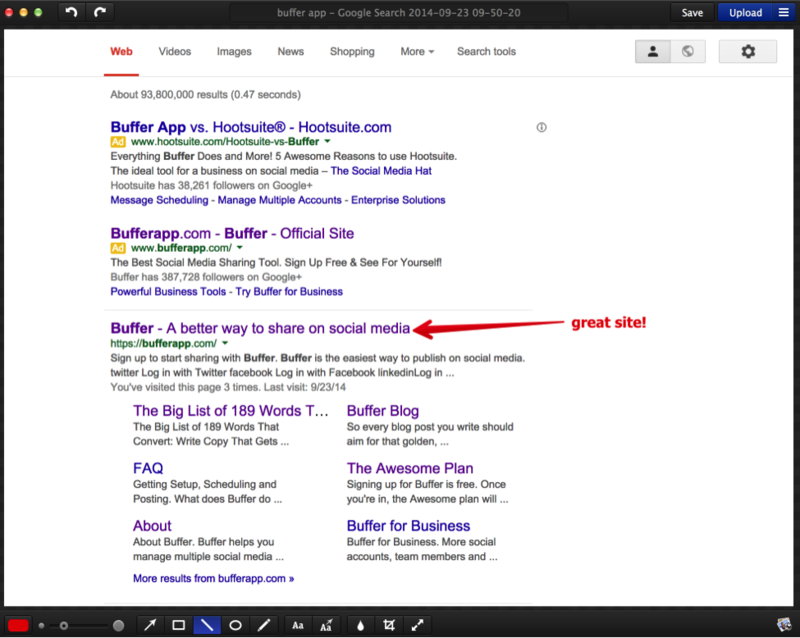 What I come up with is results about social listening that only include blog.hubspot.com in the URL. I know that the HubSpot blog has some great articles on social listening, so I specifically targeted this site in my search. A lot of times, I’m looking for images that support my points and make my article more interesting. This sounds like a time-consuming endeavor. How do I save time on this? I use Google’s image search. In the screenshot below, notice how I used a typical query, but I did so using Image search. Instantly, I come up with a variety of visual elements that I might be able to use in my article. From this view, I can go check out the website hosting the image to see if I have permission to use it in a blog post. This phase comprises the bulk of my time and effort in writing an article. I move intentionally and sequentially through my outline until I’ve covered every point in sufficient detail. Step 4: Edit and proofread. The final phase, editing, is almost as important as the actual writing. When you edit an article, you are making it ready for publication. People are going to read your article and either scoff at it or benefit from it. Editing makes the difference. First edit and proof: Revisions. After you’ve written the article, do a thorough edit job on it. Did you say things the way you wanted to? Do you need to add to a point, or move some information around? Does one section need more images? This is your chance to make the major changes that will affect the article. Second edit and proof: Copy editing. Once the article has been written and edited in a rough sense, it’s time to go through with another copy edit phase. You can do your own copy editing, or you can hire a professional to do it for you. Either way, make sure that the article is thoroughly edited for readability, style, and grammar. It really helps to get a second pair of eyes on it at this point. Third edit and proof: Phone a friend. Finally, hand the article off to someone else so they can proof it, too. The more proofreading phases, the better. They say writing is an art, but I know it’s also a science. Because I write a lot and I try to write highly-researched and thorough articles, each article needs to have a process. That’s why I’ve developed this system. It doesn’t work for everyone, but it’s something I’ve found to be useful. What techniques do you use to write well-researched articles?